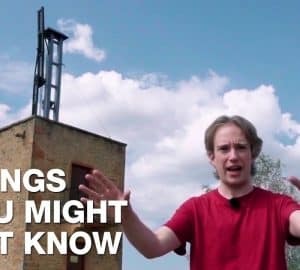 The anticlimactic battle which took place on the 7th of September 1812 was never actually fought for the town of Borodino, nor was it decisive to Napoleon’s invasion of Russia as it was intended. Historians disagree about the reasoning behind the choices of both the French Emperor and his nemesis, Prince Mikhail Kutuzov, and it’s easy to see why. 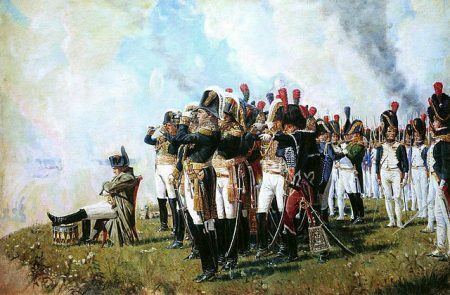 It may be said that the conflict at Borodino was a failure for both sides, despite the French win. Often called a “hollow” victory, Napoleon’s defeat of the Russian Army did just as much as his ultimate occupation of Moscow – nothing. In June of 1812, Napoleon, after assembling his units in East Poland, led a force of over 600,000 soldiers East into Russia. His intentions were to crush Barclay, commander of the army, in a decisive, knock-out battle which would bring Tsar Alexander I to the negotiating table. Hoping to deliver this fatal blow as soon as possible, the center unit of the French Army – controlled personally by Napoleon – crossed the Niemen River at 11 am on the 23rd of June. This bulk of 250,000 troops, taken from the main invasion force, commenced a rapid advance towards Barclay’s forces. Napoleon was, infuriatingly, unable to confront the Russians in a pitched battle. Even though the Russians were on a relentless retreat further and further into the Russian Empire, they were practically unable to stop the flight and form a defensive position as the enemy was close at their heels. To try and exacerbate the French supply issues, the Russians utilized a “scorched-earth” tactic, where the marching troops would set fire to the crops and farms behind them as they escaped. Hence, the Grande Armee was being drawn into unknown territory and starved at the same time, since they had extreme difficulties foraging for food. The somewhat cowardly retreat of Barclay was shamed by many of his advisers and he was certainly not a good choice of commander for the Russian Army, as he was of Scottish descent. Under pressure from his troops and generals to replace Barclay with a true Russian commander – one that would not fear the prospect of stopping the retreat to meet the French – Tsar Alexander made Prince Mikhail Kutuzov commander of the army instead, a man who he could rely on with greater confidence. Kutuzov chose to build up the rear-guard and began preparations for the coming battle. The position of Borodino was suggested by Colonel Toll, one of Kutuzov’s favourites. Therefore, the Russian Army continued to head East and directed their routes towards Borodino. There were multiple skirmishes and rear-guard actions during the journey, notably at Gzhatsk and Gridnevo. When Kutuzov arrived at the destination, just over 70 miles west of Moscow, he ordered his men to start constructed earthworks and wooden walls around the Kolocha and Moskwa rivers (the French called the bloody conflict the “Battle of Moskwa”, instead of “Borodino”). This position was chosen because the Kolocha River formed a natural and effective blockade across the roads to Moscow. From the 3rd of September onwards, this front was fortified, and soldiers were posted along its three-mile length. Napoleon was marching along the Smolensk roads. Initially, many Russian forces were posted at the Shevardino Redoubt. This area was built behind the Kolocha River and made access to the New Smolensk Road – which headed North of Kolocha to Moscow running just East of Borodino – difficult. Here, the Russians had a relatively clear view of the Borodino plains and could observe the movements of the French Army, where Napoleon was heading down the New Smolensk Road. Despite the Shevardino Redoubt’s effectiveness at blocking the New Smolensk Highway, there was a serious weakness South of the Kolocha River where the Old Smolensk Road ran. On the 5th of September, Napoleon ordered Murat to march upon Shevardino with two cavalry corps and an infantry division. 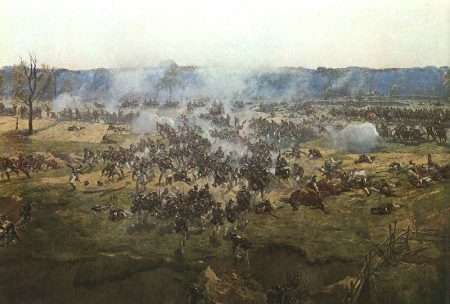 Murat collided with Konovnitzyn in a brutal cavalry clash. Ultimately, Kutuzov decided that his forces, which were currently in a bitter fight for the Shevardino Redoubt, should abandon their post and pull back to Utitza. Both sides had suffered several thousand casualties. 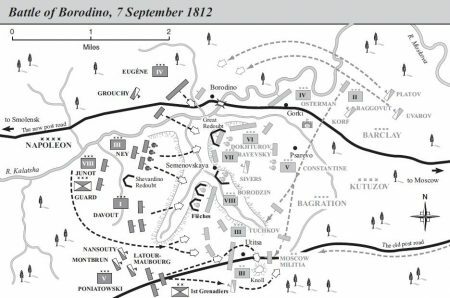 Napoleon would make the Shevardino Redoubt his operational base for the Battle of Borodino on the 7th of September, whilst Kutuzov went about creating a makeshift defensive position at Utitza. Many historians debate why he abandoned Shevardino – a well-built, fortified post – and retreated to the worse defenses at Utitza. Perhaps it was the obvious reason; he simply did not want the Old Smolensk Road to remain vulnerable. It may also be that he did not want to continue committing his left-wing soldiers to battle and drew them back to save numbers. Napoleon’s army had suffered a huge loss in numbers in the few months since they crossed the Niemen River. His forces now totaled about 160,000, his bulk of troops being depleted as a result of disease, exhaustion and starvation during the trek through Russia. On the other hand, the Russians had a similar number of soldiers, but they were better supplied than the French. The morale on both sides was very high with each army being extremely excited to gain glory and eliminate their opponent. In fact, the Russians thought they were fighting for religious purposes. 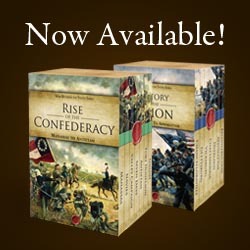 Residing in a well-prepared position and with plentiful resources, they were looking forward to the French attack. Similarly, the Grande Armee was preparing to defeat the Russians in a battle once and for all. They wished to leave the campaign victorious and force Russia to sue for peace. 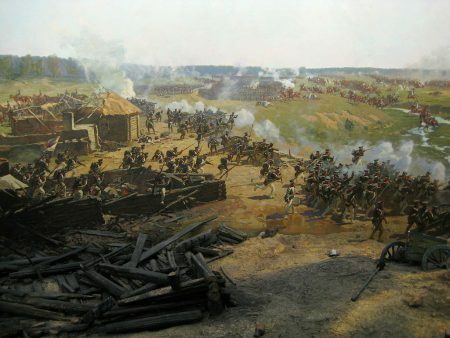 It was still clear to the French generals and Napoleon’s advisers that the left flank of the Russian defensive line was weakest and could be most easily assaulted, which would hopefully open a gateway to Moscow. They suggested that he head South and flank the Russians. However, the Emperor of France had changed a lot since his earlier, triumphal days and no longer desired the brave risks of the past. Instead, he decided to carry out a series of direct, frontal attacks on the Russian line to try and break them, forcing them to retreat. There was demanding pressure on Napoleon during the days preceding the 7th to win a victory over the Russians, especially as Duke Wellington, in command of British and Portuguese units, had defeated French forces at the Battle of Salamanca not long before. Napoleon did not get a good night’s sleep. He was plagued by numerous illnesses and did not have enough rest to prepare properly for the coming conflict. French guns opened fire at 6 in the morning on the 7th of September 1812, provoking the Russian gun batteries to retaliate. The artillery war was intense, having often being likened to thunderbolts. Prince Eugene then led a fierce cavalry and infantry charge towards Borodino and the Kolocha River on the right of the Russian line. The cuirassiers shocked the Russians and caused many men to panic. Just as the order to retreat was about to arrive at the elite Lifeguard Jagers, the 106th French Infantry Division crossed the bridge. They were quickly repelled by Barclay de Tolly’s soldiers and the bridge could then be destroyed, making access more difficult. At 10am, Prince Eugene ordered Broussier’s 14th division to launch an attack on the Great Redoubt in the centre of the Russian line. This assault was preceded by a powerful artillery bombardment, which propelled the dirt walls into the trenches behind them. Morand’s division then advanced to the Raevski Redoubt, where they forced their way into the defenses and caused Raevski to abandon post. Ultimately, Raevski was able to take back the redoubt by leading two divisions into battle. Unfortunately, the Russians had to form a new position since French forces under multiple commanders had finally captured the “fleches”, four v-shaped defenses in the South of the Russian line. The battle was a long slogging match, with the Russians throwing back the French attacks while desperately trying to hold the redoubts. Kutuzov constantly fed more men into the battle until his whole army was involved. French artillery was responsible for great damage in certain areas of the Russian line. Napoleon managed to finally capture all four of the fletches. Rather than decide to target the now-desperate left wing of the enemy, he attempted to get behind the Russian line by using a crude series of advances to try and break the defenses. Unfortunately for the French, the battle offered them no strategic advantage over the Russians. Some would argue that it tired Napoleon’s men out and expended resources which could have been rationed for later. Following the capture of the Great Redoubt, it was obvious that the Russians would no longer be able to win the battle, since the French had punctured a hole in the centre of their line, captured the fleches and still had men to spare. Surprisingly, it seems, Napoleon never committed his Imperial Guard to the battle. 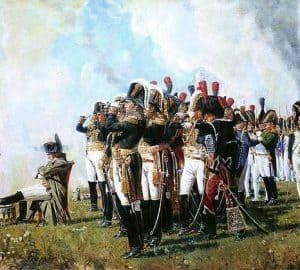 Without these troops being deployed into the conflict, Napoleon never managed to completely incinerate the Russian army and allowed them to commence a slow retreating battle. The Russians were forced to forfeit Moscow, but burned the supply stores of the city and took all the food. When they arrived in Moscow and occupied the city, the French were exhausted, hungry and bitterly cold because the harsh Russian winter was beginning. However, with limited rations to draw from, many soldiers starved in the ranks or died due to the cruel temperatures. The capture of Moscow did not force Tsar Alexander I to sue for peace as was intended and Napoleon’s army had been diminished massively since the start of the 1812 campaign. Although the French Army eventually returned home in shame with only a tenth of their forces still capable of fighting, things were still grim on the Russian side. Kutuzov had reassured the Tsar that he had taken the best defensive position of the era and was sure to win. However, he did not realize that Napoleon’s battle plan would not fit so perfectly with his tactics of holding tight and withstanding the French assaults. There were, of course, huge numbers of casualties – died, injured or lost from the battlefield – for Kutuzov’s army as well. On his side (according to estimates), more than fifteen-thousand men had been killed with another thirty-five-thousand wounded. On the French side, ten-thousand had died and over 20,000 were wounded. It really was a hollow victory with little gains – for both armies, in fact – and one of the bloodiest battles of the Napoleonic Wars. Joshua Potts is an aspiring military historian and blogger at The Augustus. He specialises in Ancient History and the Napoleonic Wars. You can find out about his work at www.the-augustus.com/writing.